Octo­ber­man is a Van­cou­ver indie band found­ed by Marc Mor­ris­sette in 2003 as a side-project to his main group Kids These Days. Draw­ing from his expe­ri­ence with Kids These Days, Mor­ris­sette has cre­at­ed two albums with Octo­ber­man, both fair­ly well-received. Octoberman’s lat­est album, unfor­tu­nate­ly, does not live up to the stan­dard of its ear­li­er work. 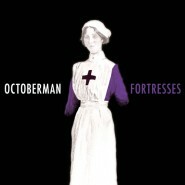 Fortress­es has some mer­it, but is ulti­mate­ly crushed under the weight of its many prob­lems. Marc Morrissette’s vocals are not among the strongest parts of Fortress­es. From the album’s begin­ning with “The Back­lash,” Morissette’s vocal style can best be described as an emo­tion­less whine. Accord­ing­ly, the album as a whole is des­per­ate­ly lack­ing in vocal strength, as Mor­ris­sette nev­er shifts away from this style, which becomes oner­ous after a very few tracks. The few attempts to increase the inten­si­ty of the vocal ele­ment to Fortress­es are not espe­cial­ly suc­cess­ful, leav­ing Morissette’s voice sound­ing strained and frankly more irri­tat­ing than before. In addi­tion, Morissette’s vocals nev­er quite blend prop­er­ly with the instru­men­tals, leav­ing Fortress­es sep­a­rat­ed into sev­er­al mediocre lay­ers. The best thing that can be said about the lyrics of Fortress­es is that they’re well-suit­ed to Marc Morrissette’s vocals, but giv­en the vocal issues with this album, that’s no com­pli­ment. Lyri­cal­ly, Fortress­es has very lit­tle mean­ing­ful con­tent (with the excep­tion of “51,” which rather amus­ing­ly cov­ers a US annex­a­tion of Cana­da). Instead, it’s com­posed of mediocre rhymes, bad­ly-con­struct­ed lines, and frankly per­plex­ing writ­ing deci­sions. The open­ing track is per­haps the best exam­ple of these prob­lems: Mor­ris­sette sings “ ‘Cause peo­ple real­ly hate your band / They write about you when they’re online / Join in on the back­lash / I guess they choose to waste their time / Rip­ping your band.” Whether Morrissette’s sub­ject is tru­ly the reac­tion to anoth­er band or whether he’s sim­ply attempt­ing to damp­en crit­i­cism of his own, it’s an utter flop. Per­haps it’s meant as sub­tle com­men­tary - but it comes off as an embar­rass­ing mis­step. In con­trast, Fortress­es’s instru­men­tals are often quite accept­able. While some tracks are not at all note­wor­thy, many make nice use of con­trast­ing or con­tra­pun­tal lines. A strong exam­ple is the sec­tion start­ing around 3:20 of “I Know a Nurse,” which is a sim­ple, small instru­men­tal inter­lude that main­tains the sound of the track while allow­ing the instru­ments to diverge from what they had pre­vi­ous­ly been play­ing. What is then per­plex­ing is the jux­ta­po­si­tion of tracks like “Thir­ty Rea­sons,” which repeat short, bor­ing lines with lit­tle to no change through the entire track, with the end result being a very bored lis­ten­er even after (in this case) only two and a half min­utes. The most like­ly cause of this dulling of cre­ativ­i­ty seems to be the infec­tious qual­i­ty of the vocals, which is clear­ly reflect­ed in the dynam­ic lev­els of the album. To say that the album remains at the same vol­ume for its entire dura­tion would be false, but to say that the vol­ume lev­el fluc­tu­ates much more than that would also be a bla­tant lie. Exclud­ing the paus­es between tracks, which become the most exit­ing dynam­ic changes on the album, vol­ume fluc­tu­ates between a sol­id mid­dle lev­el, and medi­um loud (bor­der­ing on medi­um). The prob­lem with Fortress­es is that even if it had one of the most incred­i­ble instru­men­tal parts ever record­ed, the vocals would pre­vent it from being a ter­ri­bly strong album. As it is, Fortress­es does not have an incred­i­ble instru­men­tal part. There are a num­ber of strong instru­men­tal sec­tions, but over­all, the instru­men­tals are decent at best. Fortress­es has good instru­men­tals, an over­all sound that ranges from above aver­age to well below, ane­mic vocals, and sub­stan­dard lyrics. Over­all, as an album, Fortress­es is not suc­cess­ful.